Kansas City, Mo. 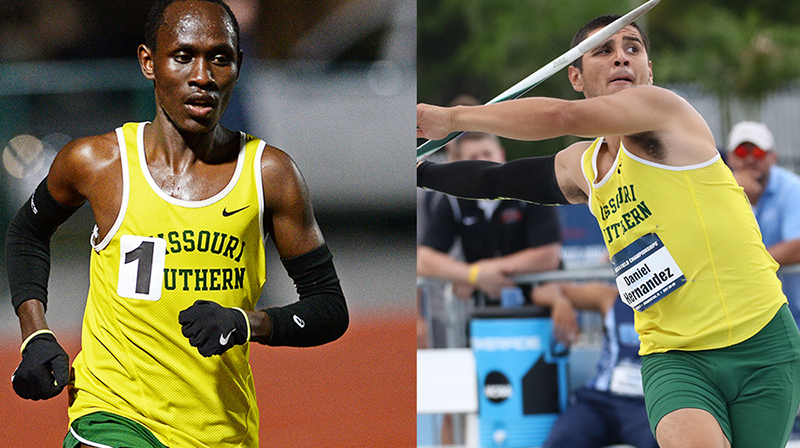 — The Missouri Southern men’s track and field program has swept the MIAA Men’s Track and Field Athlete of the Week Awards, the organization announced today. Vincent Kiprop was named the Track Athlete of the Week, while Daniel Hernandez picked up Field Athlete of the Week honors. Kiprop, a sophomore from Kericho, Kenya, set a new facility record and broke his own MSSU outdoor 5k record by 22 seconds as he opened up the 2017 outdoor season in style at the Washington University Invite. Kiprop finished the race in an NCAA automatic qualifying time of 13:53.74, 34 seconds in front of the second-place finisher in the race. The time is the fastest overall in Division II this year, and is the second-fastest time in the NCAA in all divisions. Hernandez, a junior native of Santa Anna, Calif., won the javelin at the ESU Relays this weekend. He finished with an NCAA Automatic Qualifying mark of 220-02, which currently sits number four nationally in the event. The Lions will be back in action this weekend as they are at the SBU Bearcat Invite.